How healthy does this look?! And honestly, it’s just as delicious! I’m sort of over dairy and even meat, at least for tonight, so I turned to my favorite alternative: tofu bites! They are so flavorful and crispy! If you don’t agree, then you haven’t tried them prepared the right way yet—and that’s where my tofu-bites recipe comes into play! It’s so versatile. 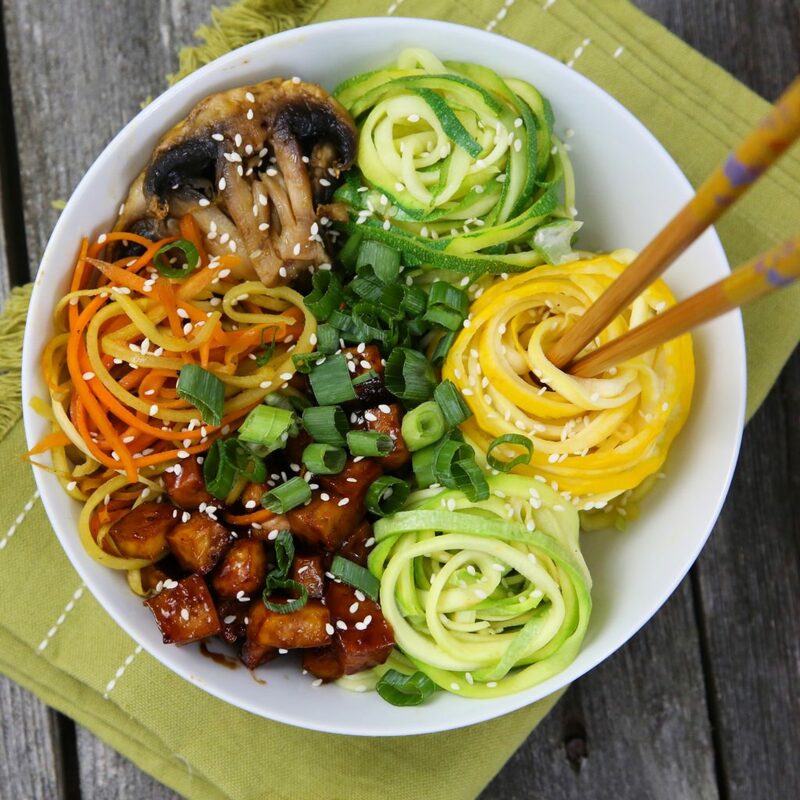 They can be used to top off this photogenic zoodle bowl, salads, stir-fries or even use them in your sushi to keep it vegan! Tonight, I was in the mood for zoodles, and lo and behold I had three-colored summer squashes in my fridge—perfect for satisfying the colorful requirement. This dinner took about 20 minutes to make (no joke), so definitely try it when a healthy but quick dinner is in order. Using a spiralizer, spiralize your 3 kinds of squashes. Julienne the carrots. Slice the mushrooms. Add olive oil to a large saute pan and heat up over a medium flame. Add in the carrots and mushrooms and sauté until soft. If you would like to keep everything separate like I did in the picture, remove the carrots and mushrooms to a plate. Sauté each of the squashes separately also for 2-3 minutes each, just until lightly softened. Otherwise just add in all the squashes to the carrots. Places the veggies on a plate, top with the tofu bites, scallion greens and sesame seeds. Use a tiny bit store bought garlic chili sauce for seasoning. If making for Passover, top with Passover-friendly toppings and sauces!